Just like Anne, I am no stranger to strawberries. The fam and I went on our second annual strawberry picking excursion out in Cedarburg, WI last weekend. We outdid ourselves this year. With over 20 lbs of strawberries, I’ve been looking for ways to incorporate these delectable juicy berries into every meal possible. I’ve made some less healthy (but delicious) strawberry almond muffins and strawberry rhubarb crisp, but I’ve also incorporated strawberries into fresh salads and this skinny BBQ recipe: tropical grilled chicken with spicy strawberry salsa. I’ve found pairing strawberries with different flavors (spicy, tangy, etc.) really balances out flavors and brings the strawberries to life in a different way. This strawberry salsa would also be great on grilled fish or fish tacos. Chicken breast is always an alternative for skinny BBQ but so often it comes out over cooked, dry and bland. This simple marinade brings sweet and tropical flavors and keeps the chicken nice and juicy. In a shallow dish, mix pineapple juice, soy sauce, garlic, cumin and onion powder. Place chicken breasts in the dish, coating in the mixture. Cover and refrigerate for at least one hour. In a small bowl, mix together strawberries, jalapeño and cilantro. Add a pinch of coarse black pepper and salt to taste. Set aside. Reduce grill to medium high heat. Place chicken breasts on grill. Cook for 7-8 minutes on each side. Do NOT keep moving and turning the chicken. Remove chicken from grill. 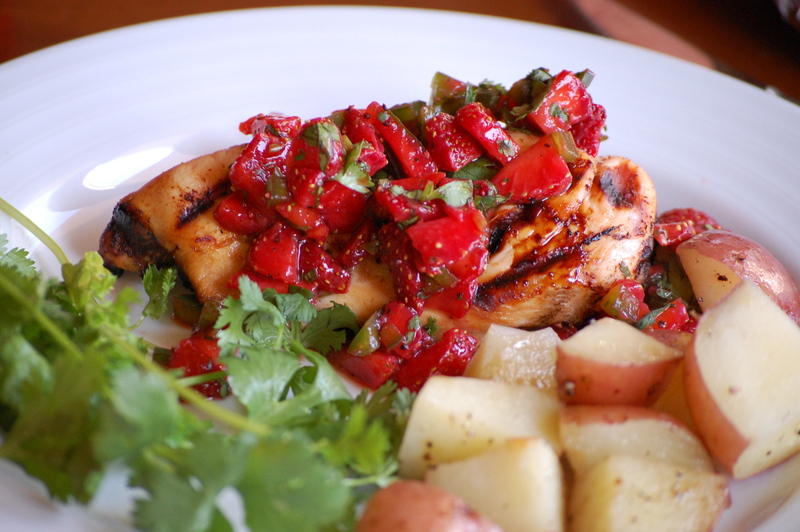 Place chicken breast on plate and top with heaping spoonful of strawberry salsa. This looks delicious and healthy and easy! Can’t wait to try it! Tried it tonight! First recipe I have tried from the blog and it is a keeper!! 🙂 I love that it is flavorful and healthy!